Join JIMENA: Jews Indigenous to the Middle East and North Africa for a special evening of Mizrahi film, food and conversation on Wednesday, January 31. The evening will begin with a buffet dinner of Israeli food, infused with Iraqi flair, and a film screening of The Dove Flyer: Farewell Baghdad. 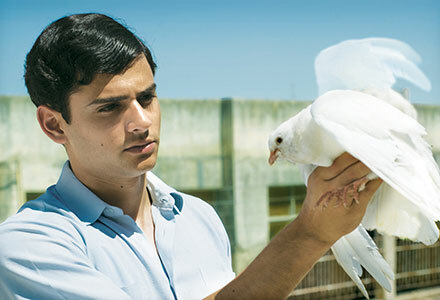 Based on the autobiographical blockbuster novel by Eli Amir, The Dove Flyer directed by Nissim Dayan is a sweeping epic recalls a lost time when over 130,000 Jews lived in Iraq. We follow the teenage Kabi as he navigates the final years of the community’s existence in Iraq, before its expulsion and resettlement to 1950s Israel. When his uncle Hizkel is imprisoned, Kabi sets off to find him, joining the Zionist underground movement. Each member of Kabi’s circle has a different dream: his mother wants to return to the Muslim quarter where she felt safer; his father wants to emigrate to Israel; Salim, his headmaster, wants Arabs and Jews to be equal, and Abu just wants to care for his adored doves. The film beautifully illustrates the complex existence of the Jewish community in Iraq, which had strong ties to the surrounding Muslim world and Arabic culture, yet simultaneously feared for its safety.